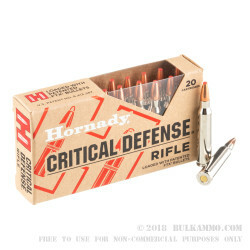 Hornady's Critical Defense cartridges are manufactured with flawless performance and care of the user in mind, no matter if the ammo is employed in a law enforcement duty role or a self-defense situation. 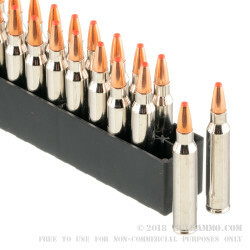 As such, these .223 Remington rounds feature reloadable brass casings that are treated with a nickel coating which is clearly identifiable, reduces friction for dependable cycling in dirty guns, and corrosion-resistant for reliable function after long periods of storage. Each casing is complimented by a non-caustic Boxer primer and a precise measure of clean-burning powder that was specifically picked and tuned for this load's terminal performance. 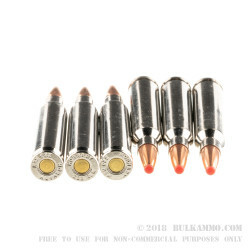 The terminal effect is enhanced by the use of Hornady's own Flex Tip Expanding (FTX) projectile which features a lead core, copper jacket, and hollow cavity covered by a flat-nosed polymer tip. The polymer tip serves as a windshield to shrug off drag as well as a guard that prevents cavity clogging and initiates wide expansion during entry into a target. As the FTX bullet expands, its copper jacket is bound to its lead core via a toothed cannelure; this prevents separation and ensures proper penetration depth to reach vital areas and impress maximum damage upon a threat. 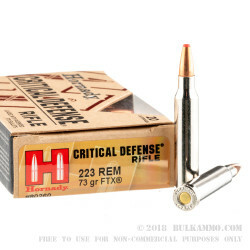 At 73 grains, this FTX is heavy for the .223 caliber and should be used with 1:8 twist rate barrels or faster for stability and accuracy.